What is your favorite Opening or Ending theme? I kinda like Free Magic by WAG. Hey all, Since the community has grown quite a lot since 2009, I think it would be nice to start "prettyfying" and organizing the forum a little bit. And I think we could use your help for that! What I was thinking we could do is implement new ranks and icons for members. Right now, the only two ranks we have are: Members and Advanced Members (not including the staff like moderators). We also have a special group called "Donators" (only one person in it so far). It would be interesting to have more of them and eventually DC-related. 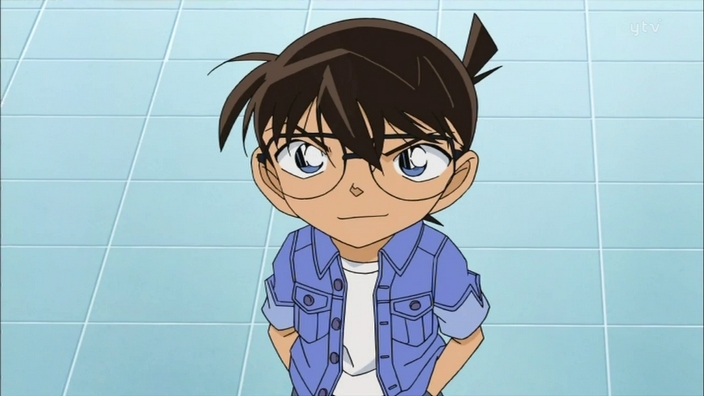 For example: 0 posts and more => Novice 10 posts and more => Detective boy 50 posts and more => High-school detective 100 posts and more => Detective etc... or we could be original and have: 0 posts and more => Genta's friend 10 posts and more => Ayumi's friend 50 posts and more => Mitsuhiko's friend 100 posts and more => Detective Boys 500 posts and more => Ai's friend 1000 posts and more => Ran's friend 2500 posts and more => Gin's nemesis etc... You get the idea. So, what I'm asking of you guys is to suggest nice/cool/fun ranks and then we'll choose the best ones (or do a vote, we'll see). Don't hesitate to think outside of the box! As for the icons, you may have noticed that we only have: x number of dots for members: Admin: Moderators: Once we decide on the ranks or if you feel motivated, we would really like some suggestions or designs for the icons as well. For example, it could be Genta's face for the "Genta's friend" rank, etc... Again, any idea is welcome. Just let your imagination go wild! I hope this is gonna be a successful little event here and that you guys have fun with it. Thank you and may the fun begin! Good call. With the new update I forgot to reinstate signatures. My bad. It's all good now though. So have fun! Yes, you're always welcome to help out with the server fees. Any help is greatly appreciated. Thanks for the kind words. Glad you enjoy it! Welcome to DCW. Made some more changes. Should be looking better now. Thanks! aStore (Amazon Store) has already been retired. Good point. I removed the Shop for now until we find an alternative (if you have one, do not hesitate to comment ). Thanks for bringing this up. Good catch. This was fixed. Pages should have SSL enabled by default now. I've been thinking for a while now about developing a "detective" type game (however small or big it might be) and I've just not figured out the best gameplay factor/strategy yet. I was thinking, as a start, of a web-based game that we could even publish on Facebook and/or MySpace. But just like any creation, finding the right and best concept is the most difficult part. I'm actually not worried about the development part at all! It's all about the ideas and the level of fun we can integrate into the game. So, that's where you guys could help out! Do you have any idea that could make a "detective" game work? And be fun/enjoyable? Just pieces of ideas would help too. Then, just like a puzzle we could assemble a full game putting them together! It would be soo awesome if we could release a DCW game entirely conceived and created from scratch by its very own community! Anyway, use this thread as a placeholder for ideas that could potentially be useful or fun in a detective-type game. Thank you! Hello all! I'm very pleased to announce that we now have new DCW-related rank icons on the forum! It's been quite a while since I've wanted to make something like that for DCW (see forum thread: www.detectiveconanworld.com/forum/topic/801-looking-for-ideas-and-talent). I finally went ahead and did something nice and simple. A first version of something that could evolve further more in the future. At least, it'll be a good upgrade to what we have right now! Here are the rankings: Administrator: Moderator: Observer (Validating members): Eyewitness (Normal members): Protagonist (100+ posts): Officer (500+ posts): Inspector (2000+ posts): Detective (10000+ posts): Secret Agent (Donators): Black Organisation (Banned): That's about it! Feedback welcome as usual! Thank you. Hello everyone! You may have noticed that the site has been down for a few hours today. I've had to put the site into maintenance mode in a bit of a rush to initiate upgrades to several server services (following the recent changes I've had to undertake to counter the spam/hack issues). The operation seems to have worked out well. But if you find any issues on the forum or wiki, please let us know here. Thank you! I would also like to give you a heads up regarding a potential upgrade to our forum platform coming up very soon. Therefore, the board might be down for a little bit while we perform the upgrade in the coming days. Thank you for your patience!